So, i’ve been using electric scooters for the past 4 years, which many people will know (because I’m always talking about them..sigh), but what you might not know is that I decided I wanted to do something about helping others to go electric! At the beginning of this year I connected with Melex electro vehicles and created ewizz to promote, sell and support electric vehicles here. Here’s what they look like! The main reasons I started riding electric scooters? Forget about gas – electrics don’t use gas! So no need to worry about fuel prices. Reduced dependancy fossil fuel – I’ve put down the pump, well mostly. I really enjoy cruising around on my electric, it costs me virtually nothing to run. For example, The electricity to commute around 10,000 km a year costs me less than one fill of the gas tank. Yup, around R500 in fuel for a year of commuting at 45 km a day and I’m keeping the kilometres off my car, which means it will last much longer. And yes I’m a wimp, if its very wet and windy or I need to carry more stuff then I take the car. Problem solved! My Thunder 6 electric scooter is silent & smooth, so with the bluetooth kit in my helmet I can listen to music, podcasts and make and receive calls while I going. That’s nice so I’m always in contact and can use the time efficiently. One of the reasons the electric scooter is so cheap to run is that there is very little maintenance. There are no gears, belts or chains and no oils. Every 10,000 km I’ll have to look at new brake pads and tyres and check the nuts and bolts. These ewizz electric scooters have regenerative braking which makes the brake pads last longer too and produces less polluting brake dust. 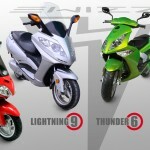 Batteries can be a concern, however my Thunder 6 electric scooter has lithium ion batteries and these are warranted for at least 5 years or 50,000 km, they should do a lot more and there are examples of these bikes with over 50,000 km in israel on fleet operations. The lead acid based batteries don’t last as long but they are cheaper to buy and replace. I’m investigating other technologies that can improve battery life on the models without lithium ion. They are just great fun too!